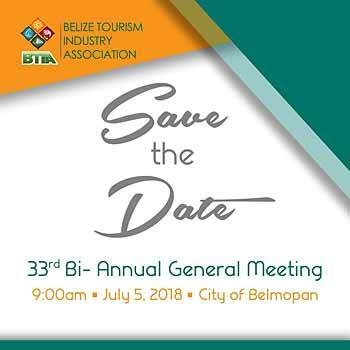 BTIA President, Raineldo Guerrero and the Board of Directors cordially invite all Members to our 33rd Bi-Annual General Meeting to be held in the City of Belmopan. The Belize Hotel Association held its Annual General Meeting on Tuesday, July 3, 2018 from 1:00 PM- 5:30 PM at the Black Orchid Resort in Burrell Boom, Belize. In attendance were the Board of the BHA, Association Members, other Tourism Stakeholders and guests. Distinguished guests included Mrs. Karen Bevans, Director of Tourism, Ambassador of Guatemala to Belize, H.E. Georges de la Roche Du Ronzet Plihal , Dr. Luis Montero, Honorary Consul of Belize in Chetumal, Mr. Alfredo Pacheco, Director of Tourism in Chetumal, Mr. Jonatan Sosa, Director of Economic Development in Chetumal, Mr. Yashin Dujon, CEO of the Ministry of Tourism, Mr. Ishmael Quiroz, Executive Director of the Economic Development Council, Ms. Karen Pike, Director of Marketing of the BTB, Mr. Raineldo Guerrero, President of the BTIA, Mr. John Burgos, Executive Director of the BTIA, and Ms. Julie Yapp, Assistant Regional Security Officer- US Embassy, among others. Ambassador H.E. Georges de la Roche Du Ronzet Plihal, spoke on the relief efforts in Guatemala, following the recent natural disasters in their country and thanked the Belizean people for their assistance and support. Keynote speaker at the AGM, was Ms. Stephanie Rest, CEO and Founder of Caribbean Wellness and Education. Caribbean WE cultivates events and education courses for spa, wellness and tourism professionals in the region. She spoke on the rapidly growing wellness market, and how Belizean stakeholders could utilize already existing tools, products, services, or interests, that appeal to this type of traveler, and tap into this million dollar market. Guest Speaker, Ms. Martha Valdivia, is the Director of Membership Development for the Caribbean Hotel and Tourism Association. She has an in-depth knowledge of online sales and marketing, and her experience includes cultivating and maintaining partnerships in the Caribbean. She spoke of Belize's position in the Caribbean market, and our shared issues, culture, markets, and ideas. She advised that as regional tourism stakeholders, we should " step-up" and take advantage of all the marketing, advocacy, networking, and learning tools that we can garner from our Caribbean partners, while offering the same as "One Caribbean Family". Mr. William Smith and Mr. Lizandro Ramos, from COPA Airlines provided insightful information about their airline routes that provide easy connections for the new emerging Latin American Market. They raffled a round trip ticket to Panama, courtesy of COPA Airlines, and the winner was drawn from the meeting attendees. 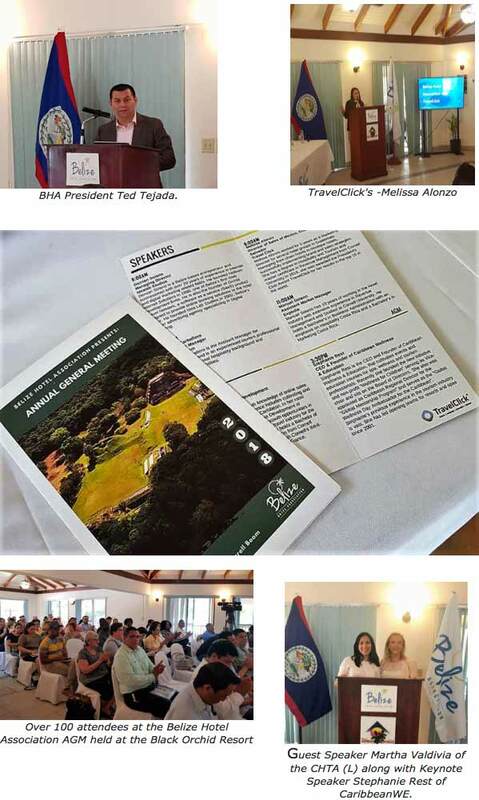 Mr. Ted Tejada, President of the Belize Hotel Association delivered the President's address, followed by the Financial report, given by Treasurer, Mr Rudy Gonzalez. Ms Trinity Castro, Director, presented the Marketing Report which highlighted the international and local efforts from the last membership year and the new initiatives that the BHA will be embarking on this year, to further promote its members and the country of Belize. Vote of Thanks was given by Director, Ms. Roanne Badillo. An auction of prizes and Gift Certificates, was done in support of the BHA Scholarship fund, which assists with educational expenses for children of staff of BHA members. The Belize Hotel Association would like to thank all who donated to this effort, namely Travellers Belize, Best Western Plus Belize Biltmore Plaza, Cayo Espanto Resort, Ramon's Village Resort, Courts Belize, Wine de Vine, Ayin Ha Adventures, Mirab and Company, Banyan Bay Suites, San Ignacio Resort Hotel, Banana Beach Resort, The Added Touch, Victoria House Resort and Spa, Naia Resort and Spa, Hamanasi Adventure and Dive Resort, Black Orchid Resort, Tropic Air and Ms. Beverly Dawson. The meeting was followed by a poolside cocktail sponsored by Travellers Ltd and Bowen and Bowen. Prior to the AGM, the Belize Hotel Association hosted an informative seminar from 8AM to Noon. Presenters from TravelClick, Expedia, Idealab Studios, Booking.com, Hotelbeds, and Tourico Holidays updated attendees on emerging marketing trends, new technology, digital marketing and revenue generating techniques. The Belize Hotel Association would like to thank TravelClick for sponsoring this event. The Belize Hotel Association (BHA) is a non-profit, non-governmental organization and Belize's oldest private sector tourism organization. Its membership is comprised primarily of accommodation providers including hotels, resorts, lodges, condominiums and educational facilities with allied members including tour operators and ancillary businesses that service the hospitality industry. The BHA works diligently to support the sustainable growth of member hotels and the tourism industry in Belize through global marketing initiatives, private and public sector partnerships and training opportunities aimed at increased standards and professional service. Above all, the BHA is committed to ensuring that visitors to Belize receive quality service at a fair price.